You can actually see how lean Bernie's Bacon is...and you'll be amazed at how little it shrinks in your skillet. 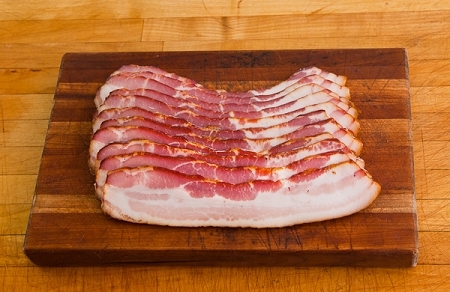 The taste of our bacon is unforgettable because we smoke it over Applewood sawdust to give it that rich, smoky flavor. Comes thick-sliced and in 12oz. vacuum-sealed packages for your storage convenience.